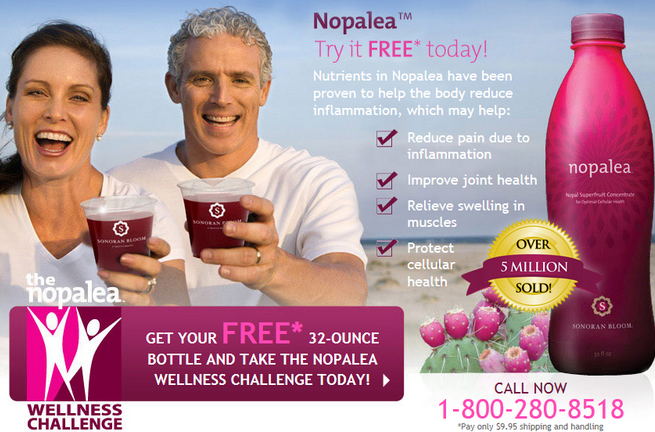 The marketers of Nopalea have agreed to refund customers $3.5 million after the FTC found the company’s advertisements to be deceptive. Advertisements featuring carefree, beautiful smiling people sipping on juice might not be enough to entice someone to buy a product, but plastering claims that the drink is a cure-all for pain could probably do the trick. But when those promises aren’t supported by, you know, actual science, then it’s called deceptive and federal regulators won’t stand for that. The Federal Trade Commission announced Tuesday that dietary supplement company TriVita, Inc., the marketer of the drink Nopalea, has agreed to provide $3.5 million in customer refunds to settle charges that its ads deceived consumers with unsupported claims that the drink would treat a variety of health issues. Infomercials hawking the product included endorsements by former model Cheryl Tiegs and marketed the drink as an “anti-inflammatory wellness drink” that relieves pain, reduces and relieves joint and muscle swelling, improves breathing and alleviates respiratory problems, and relieves skin conditions. Making unsupported claims that Nopalea significantly improves breathing and relieves sinus infections and other respiratory conditions, and provides significant relief from pain, swelling of the joints and muscles, and psoriasis and other skin conditions. Making false claims that the health benefits of Nopalea were proven by clinical studies. Failing to disclose that supposedly ordinary consumer endorsers were in fact TriVita sales people who received commissions for selling the defendants’ products. In addition to refunding consumers, the settlement agreement bars TruVita, and the other defendants, from making the health claims alleged in the complaint when marketing Nopalea or any food, drug, or dietary supplement without randomized, double-blind, placebo-controlled human clinical tests conducted by qualified researchers. Additionally, they are barred from making any health claims without competent and reliable scientific evidence, from misrepresenting that health benefits are clinically proven when they are not and failing to disclose any material connection between endorsers of their products and themselves.